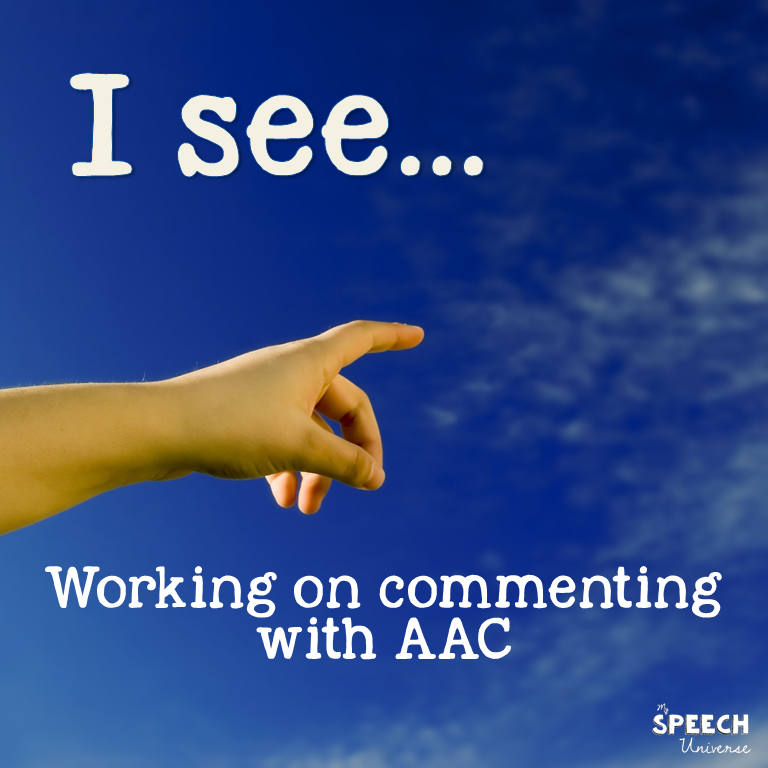 How to work on commenting with "I see..."
How many times have you had this problem? 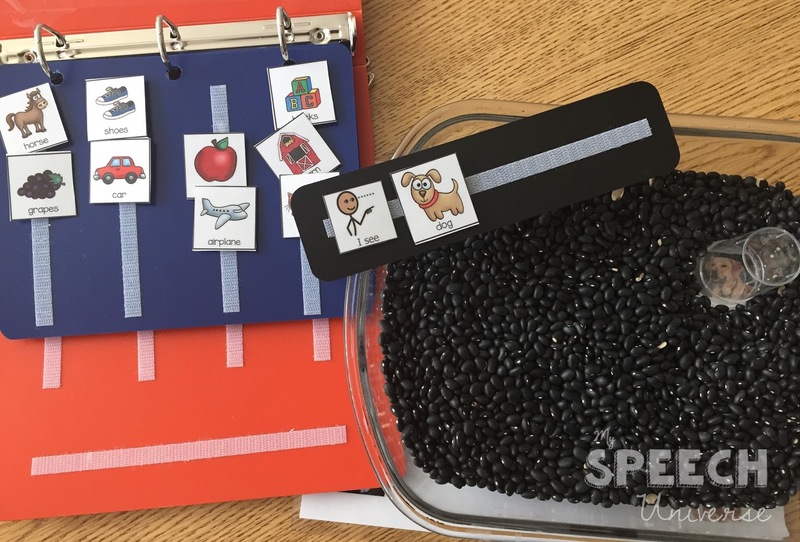 You have worked hard on requesting with a student who is using an AAC device or picture communication book, and they are requesting up a storm! Not a problem really, right? Well, what if they could do even more with their communication? How about the next step which would be commenting! How great is it to give a child a way to comment on their world, and not just request in it? 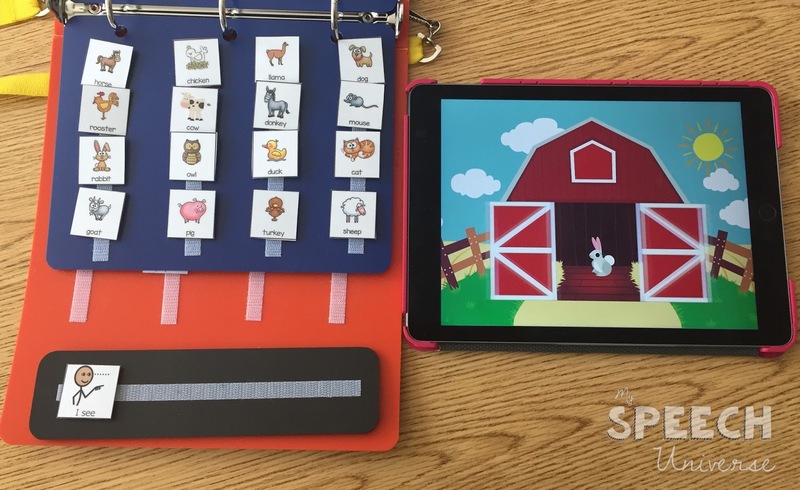 A friend of mine posted this video in an AAC group, and I thought it was great. This You Tube channel called TheDadLab has so many great ideas for exploring with young children! My initial thought was, "I see blue water all over the floor!" These little cuties are having a great time exploring a small area, and I can really see how this would be great, but I also saw a huge mess of blue water on my carpet thanks to some of my more enthusiastic friends. I decided to try something similar, but using beans. I know that this could still cause a mess, but vacuuming up a few beans is much easier than cleaning up a big blue stain on the carpet in my office! I took a clear glass baking dish and poured enough beans inside to cover the entire bottom. I then took a piece of paper with pictures printed on it and placed it under the glass dish. I then took a clear plastic cup that I cut down in size and cleared a space in the beans for the cup. 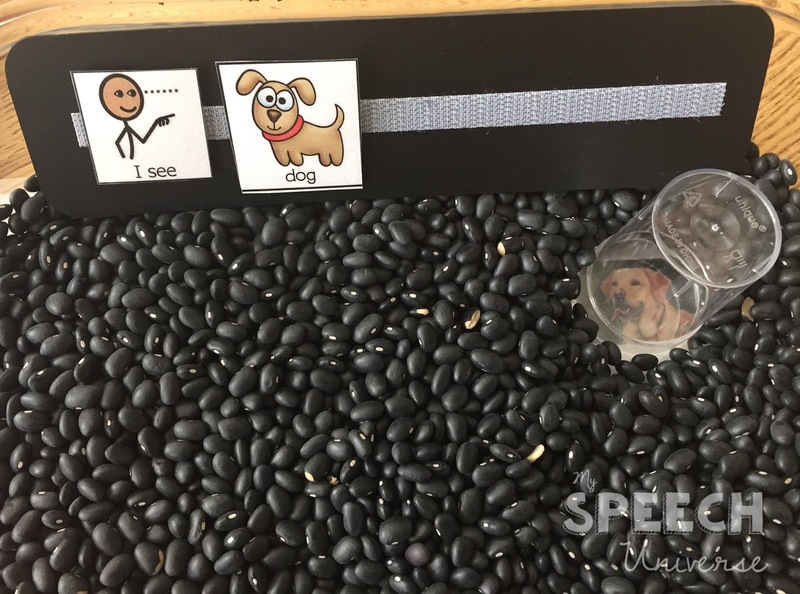 My students were able to move the cup around and see what was hiding underneath the beans! 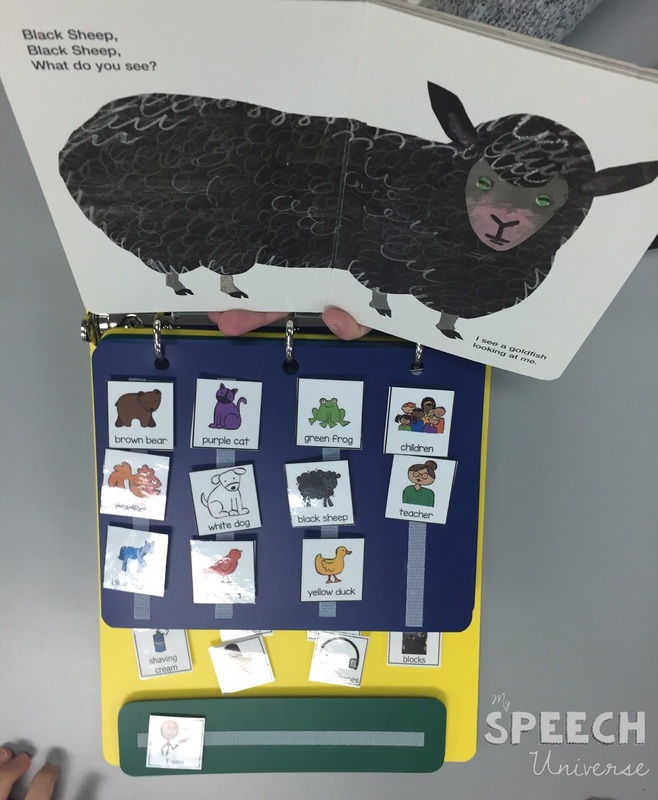 Using books is a great way to work on "I see..." Board books work well when focusing on commenting. They are durable and will withstand use from my most enthusiastic friends. 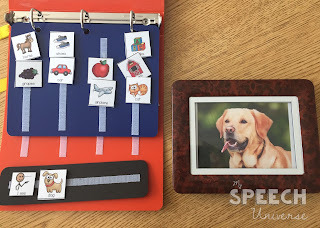 I like to pull out an activity page with icons that represent pictures in the book. I found this picture viewer when I moved into my speech room years ago. 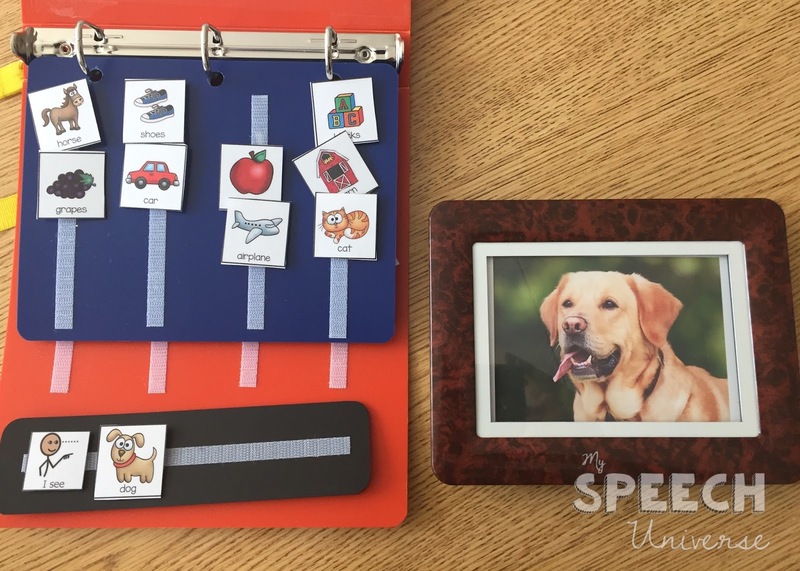 It is great for going through a bunch of pictures, and engages my students more than just flipping through the pictures with our hands. They love pulling down the tray to change the pictures! 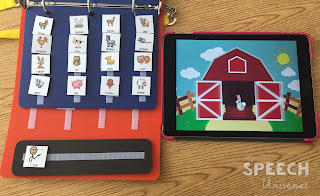 One more way I like to work on "I see" is with an iPad app called Peekaboo Barn. This app is really cute and engaging! I made visual icons to represent everything that pops up in the app. 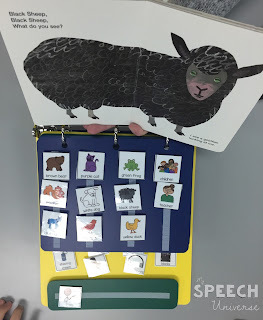 The students tap on the barn door to reveal who is behind the doors (look for a later post on how to use this for "I hear"). I should also say that even though the "I see" icon looks like it is always present on my sentence strip, I actually move it back to the same spot in their books every time they make an exchange. I keep it on the same page as their "I want" icons, so they do have to learn some discrimination for these tasks. I hope you can use some of these tips and work on commenting with your students! I love the idea for the tray of beans! That was a great way to modify the activity to avoid much of the messiness. Thank you. Going now to assemble a tray of beans!! Thanks! Do you have any suggestions for working on discrimination between I want and I see. I have students who do well with requesting but then when I start working on see they over generalize and use I see for requesting. When I do the I see activities I try as much as I can to use pictures at first and keep the pictures out of reach so I can quickly switch them. I also like to go to a window and point out things that I can see. I have used a window where we can see the playground and comment with what I see. I try to model it first using the PECS. Then I have my students comment too. We might go out to the playground then and also comment on I see. Once they are solid in the fact that they are not going to get what they comment on, I model a request with I want and go play on the equipment I requested. Hope this helps give you some ideas.